Basel, April 11, 2019 – The recent Fridays for Future protests demonstrate a global dissatisfaction with the continuing failure of governments and industry to protect the climate. And the setting of the Doomsday Clock hands to 2 minutes to midnight in January this year indicates a continuing high risk of a nuclear conflict. 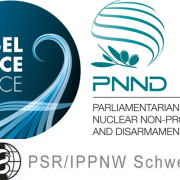 However, ‘devastating climate change and the risk of a nuclear war will not be prevented unless the international community tackles the economic and political influence of the fossil fuel and nuclear weapons industries’, according to participants of Move the Nuclear Weapons Money, an international conference being held in Basel, Switzerland on April 12-13, 2019. 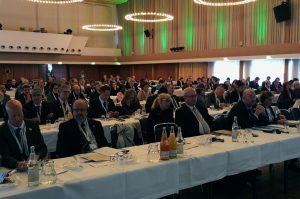 Hamburg/New York, 5th April 2019 – On the eve of the UN Economic and Social Council (ECOSOC) Youth Forum and the 140th IPU Assembly, the World Future Council, the Inter-Parliamentary Union (IPU) and the United Nations Development Programme (UNDP), with the support of the Office of the United Nations Secretary-General’s Envoy on Youth, the International Labour Organisation (ILO) and Youth Policy Labs, have kicked off a global call for nominations to identify and honour the world’s most successful policies enabling youth empowerment. 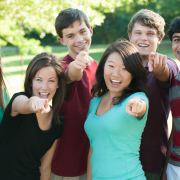 Today, there are 1.8 billion young people – the largest generation the world has ever seen. The majority of them live in the so-called developing world. They are almost three times as likely as adults to be unemployed. Yet young people embody the potential of a society and play a crucial role as key architects of the future of their families, communities and countries. Young people are on the frontlines of political and social change and have the power to renew cultures as well as maintain important traditions. With the multiple global challenges we face – climate change, unsustainable food systems, dramatic loss of biodiversity, water scarcity, growing inequalities, conflicts and much more – it is absolutely critical that youth empowerment is promoted and supported through inclusive, effective, inspiring and innovative laws and policies that promote their rights and speed up common action. It is also vital that youth voices are heard and that they meaningfully participate in the design, implementation and monitoring and evaluation of such laws and policies for example, through parliaments, civil society organizations, and other formal and informal means. 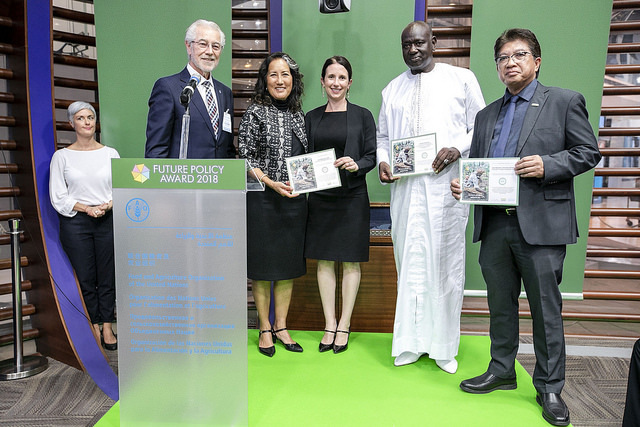 The winners of the 2019 Future Policy Award will be celebrated at a high-level award ceremony at IPU’s 141st General Assembly in Belgrade (Serbia) in October 2019. The Award Ceremony typically brings together more than 200 decision-makers, including heads of state, ministers, permanent representatives, parliamentarians, youth, heads of international organisations and leading civil society organisations from across the world. 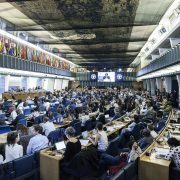 Mayor Ba, you have recently received an Honourable Mention of the Future Policy Award 2018, at the FAO Headquarters – how do you feel about this high-level recognition? 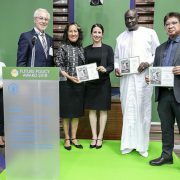 Honourable Mentions of the Future Policy Award 2018: Los Angeles, Ndiob and Kauswagan. It was a great pleasure to receive this award. It is the confirmation that our vision and our programme are relevant. However, we won’t brag about this award. We consider it as a motivation to keep working and fighting. It is like an “engagement letter” that the stakeholders gave us to promote agroecology and to prove that agroecology is a credible alternative to conventional agriculture that fails to feed the world. When did you actually think about agroecology for the first time, and about starting an agroecological transition in Ndiob? Was there a key moment triggering your action? I am of peasant origin and in spite of the responsibilities I’ve had at the national level, I’ve always been closely related to my family. It allowed me to note the constant degradation of natural resources, fauna, flora, ecosystems and the lower yields that generated impoverishment! Poor agricultural practices and excessive use of synthetic chemical inputs have contributed significantly to soil leaching and declining soil fertility. Our parents and grandparents did not use these synthetic products but had good harvest and preserved biodiversity. So we decided that the best thing we could offer to the younger generations and to the future generations was a sound environment and the abundance we had when we were young. When we realized that, we turned to agroecology. We researched to understand agroecology and we experimented with success in fields and farm schools. Encouraged by our first results, we decided to scale up by generalizing the experience throughout our community. However, to be more effective, it was necessary to have the support of local government. So we decided to run in the municipal elections on an environmental list. The people trusted us and we won by a landslide. Since then we have initiated the process of ecological transition for our municipality. This earned us the award from FAO and its partners like World Future Council and IFOAM – Organic International. Looking at what has been achieved so far in Ndiob, what are your impressions? 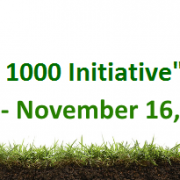 We have successfully launched the agroecological transition process. There was a lot of training, awareness raising and experimental activities. We managed to increase the yield of millet from 350 to 1000 kg per hectare on a 100-hectare sample. The populations are enthusiastic and embrace more and more our vision. The use of chemical inputs is decreasing and we are slowly moving towards the use of organic inputs. What will be the next steps ahead of you? At the local level, the next step will be to achieve in 2019 the agroecological transition of two villages (Thiallé and Soumnane) of the municipality. These two villages unanimously decided to adopt agroecology as a rural development model. We defined a support programme to help them achieving their ecological transition. We are currently looking for technical and financial partners for the realization of this programme. This territorial approach is important. We will build on this process and model it in view of its replication in the other villages. The objective is to extend the project within three to four years to all the villages in order to make Ndiob a green and resilient municipality. 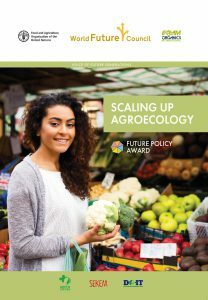 At the international level, it would be great if a programme of exchanging experiences that were awarded by the 2018 Future Policy Award could be set up. As champions in this field, we need to strengthen our relations and establish a core group that will, with the support of partners, provide leadership in the promotion of agroecology at the global level. Learn more about Ndiob by visiting our Future Policy Award 2018 winners page. Our current food and agriculture systems are driving the vast depletion of natural resources, fuel inequality and contribute to climate change. We urgently need to shift to more sustainable food systems that deliver environmental and social outcomes and are able to withstand shocks and climate change! 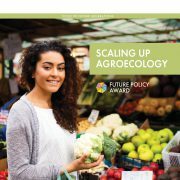 Agroecology is a key element in this process – this is why the Food and Agriculture Organization (FAO), the World Future Council (WFC) and IFOAM – Organics International kicked off together the Future Policy Award 2018, a global contest for the world’s best agroecology laws and policies. 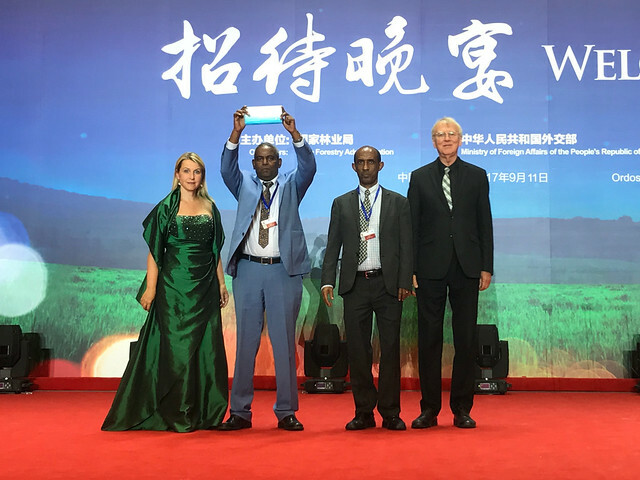 Ethiopia’s Tigray region has received the Future Policy Gold Award this year for their pioneering approach in successfully combatting desertification. Thanks to their policy, the region has made significant progress in restoring its degraded lands and improving its food and water security. The impressive results derived from the major land restoration undertaken by local communities and the regional government, with a unique combination of collective action, voluntary labour and the involvement of young people. After the Award ceremony on 11th September during the UNCCD summit in Ordos, Inner Mongolia (China), the people of Tigray celebrated the Future Policy Gold Award in their own country. A colorful ceremony was held with 1500-2000 people at Hawelty Martyrs Hall with Tigray’s president, H.E. Abay Weldu, the Speaker of House of Representatives of Tigray region, H.E. Kidusan Nega, H.E. Dr Eyasu Abraha, Minister of Ministry of Agriculture and Natural Resources of Ethiopia and other high-level guests attending, followed by a parade through the Mek’ele, the capital of Tigray. In conjunction with the celebration, the University of Mek’ele (MU), in collaboration with Bureau of Agriculture and Natural Resources of the Regional State of Tigray, organised a panel discussion at Desta Hotel, Mek’ele. The event was opened by a welcoming speech by Prof. Kindeya Gebrehiwot, MU’s President. The event was celebrating Tigray’s achievement, and the panelists were discussing how soil conservation towards land fertility and combating desertification can be further improved and maintained for the future. 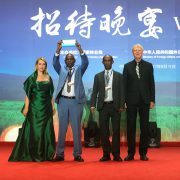 The World Future Council was honoured to hold its Future Policy Award ceremony during the thirteenth session of the Conference of State Parties to the UN Convention to Combat Desertification (UNCCD COP13) in Ordos, China, the international summit on desertification and land degradation. 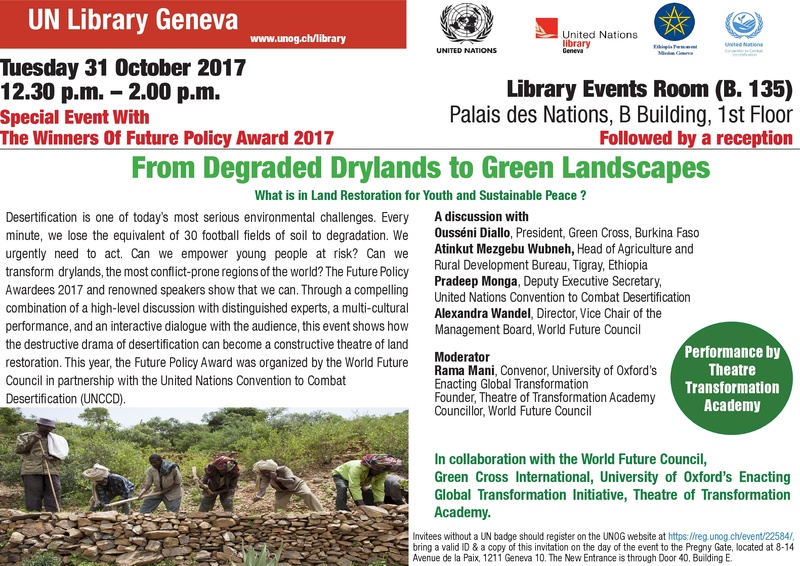 On 12th September 2017, we joined the summit’s Land for Life Day and organized a session on: Policies and land: Can good policies facilitate the achievement of Land Degradation Neutrality Goals? The event was designed to present the winning policies of the Future Policy Award 2017 to stakeholders from around the world. 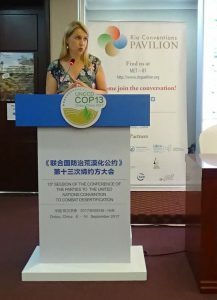 Alexandra Wandel, director of the World Future Council, at the Land for Life Day in Ordos, China, during the UNCCD COP13. the significance of adequate policies for achieving land degradation neutrality and presented the panelists. At first, Ms Alexandra Wandel, Director and Vice-Chair of the Management Board of the World Future Council, emphasized that the Future Policy Award is worldwide unique in honoring laws and policies at the international level. She gave a brief introduction to the Awardees 2017 and expressed also the Council’s gratitude to UNCCD for being this year’s partner of the award. The winning policies were presented by Dr Atinkut Mezgeb who portrayed the large-scale land restoration efforts of the Tigray policy in Ethiopia (Gold Award), Ms Fernanda Cruz, who revealed how Brazil’s Cistern Programme mitigates effectively the drought in the Semiarid region (Silver Award), Dr Paul Luu presented on the innovative 4 per 1000 Initiative (Vision Award), whilst H.E. 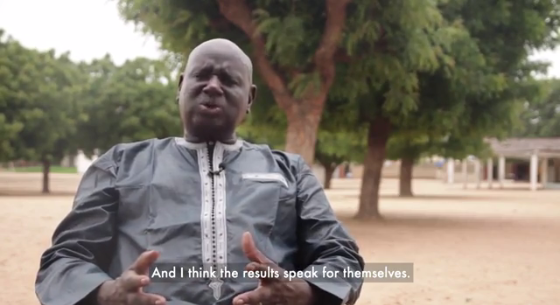 Ali Bety uncovered the success factors of the 3N Initiative from Niger (Bronze Award). A video tribute was also paid to the winning policies from China, Australia and Jordan. After a lively Q&A round, Jakob von Uexkull, Founder of the World Future Council, offered some closing remarks. In the resources section below you can download the detailed programme of the session and the overall programme of the Land for Life Day. 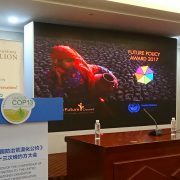 Hamburg (Germany) / Ordos (China), 12th September 2017 – Yesterday, the Future Policy Award (FPA) ceremony was held at the thirteenth session of the Conference of the Parties to the UNCCD in Ordos, Inner Mongolia (China). The international “Oscar for best policies” honours laws and practices that successfully combat desertification and land degradation. 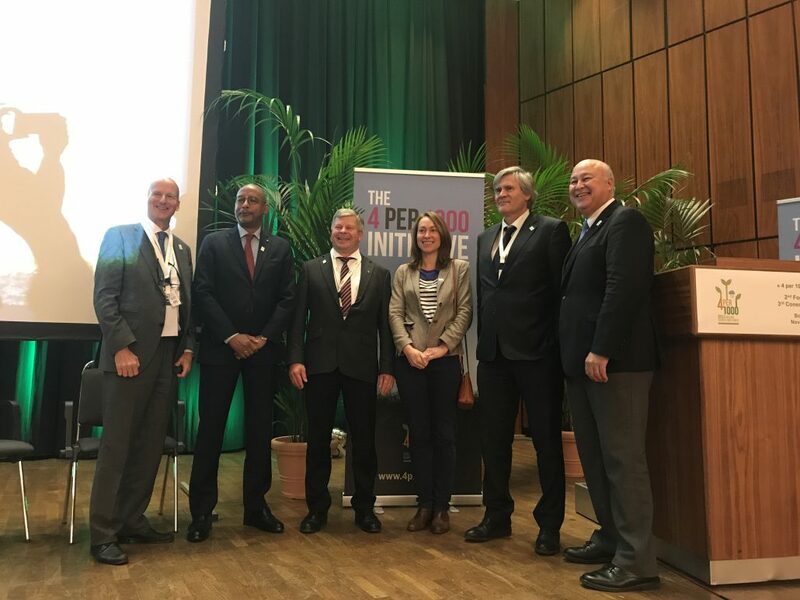 The FPA is awarded by the World Future Council (WFC) in cooperation with the United Nations Convention to Combat Desertification (UNCCD). Among the laureates are the Ethiopian Tigray region, Brazil and China. The ceremony was attended by 300 high-level guests and ministers from all over the world including H.E. Mr. Zhang Jianlong, Minister of State Forestry Administration of China, H.E. Ms. Bu Xiaolin, Governor of Inner Mongolia, as well as Tigray’s President H.E. Mr. Abay Weldu. The FPA aims to draw more attention to desertification and effective ways to combat it: In the last century, droughts cost more lives than any other weather-related catastrophe. Climate change intensifies the process of desertification. Actions to combat desertification, therefore, not only contribute to protecting the environment but can also provide social and political stability. 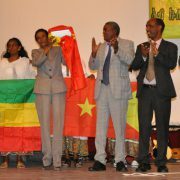 Ethiopia’s Tigray region was granted the Gold Award. 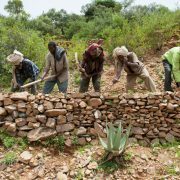 Using a unique combination of collective action, voluntary labour and the involvement of youth, the people of Tigray are restoring land on a massive scale. As a result, erosion has decreased significantly, groundwater levels are recharged, and the uptake of sustainable agricultural practices made a remarkable contribution to food self-sufficiency and economic growth. The Future Policy Award highlights the world’s best policies and laws that create the framework for better living conditions for current and future generations. The winning policies are introduced in short videos which are on our YouTube Channel. Further information on the winning policies may be obtained through our website as well as on futurepolicy.org. Please check out our Flickr album for more pictures of the award ceremony. The United Nations Convention to Combat Desertification (UNCCD) is the only legally binding international agreement on land issues. The Convention promotes good land stewardship. Its 196 Parties aim, through partnerships, to implement the Convention and achieve the Sustainable Development Goals. The end goal is to protect our land, from over-use and drought, so it can continue to provide us all with food, water and energy. By sustainably managing land and striving to achieve land degradation neutrality, now and in the future, we will reduce the impact of climate change, avoid conflict over natural resources and help communities to thrive.